My wife hipped me to this poet a couple days ago. I've been mulling over the BBC program and her poetry, and feeling parochial. I've reached the point where what I like is what I like, and while I'm pretty open, especially when it comes to poetry, there's nothing like getting a blast of perspective from another culture entirely to make you feel small and wan against the big body that is world poetry. The poet, artist and film-maker Imtiaz Dharker was born a Muslim in Lahore, Pakistan and educated at a school with a strict Protestant ethic in Glasgow where her family moved to when she was a child. When growing up she began to question and challenge the restrictions of her religion, particularly on women, and poetry was a place where she could do this. The titles of some of her poetry collections reflect the issues she grapples with: Postcards from God, I Speak for the Devil, and The Terrorist at my Table. In her recent collection Leaving Fingerprints, Imtiaz Dharker has been inspired by the Sufi poets and attracted by their belief in the continuous recreation of the self. 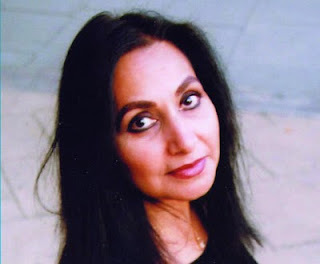 However, Imtiaz Dharker is far too earthy and sensual to want to be labelled as merely a 'spiritual writer'. Here's a poem from her site. I tried to find the poem 'Honour Killing' online, as it seems her most well-known but couldn't locate it. Which means another book purchase. Meh (not really). I haven't got this right . This poem very effectively transitions from humor to... something else. Thanks for introducing me to her work.